This year, I had a dream project land which turned out to be one of my favorites from start to finish. Now the thing about dream projects is, you never know when or if they're going to land. That's the part you can't control. What you can control, however, is cultivating your skills and work ethic so if it lands, you'll be well equipped to tackle it with all your might. When the folks from Wings Over Washington approached me with what I considered a dream project, I knew everything I'd learned and drawn up until this point would be instrumental in completing challenge at hand. What was the challenge? 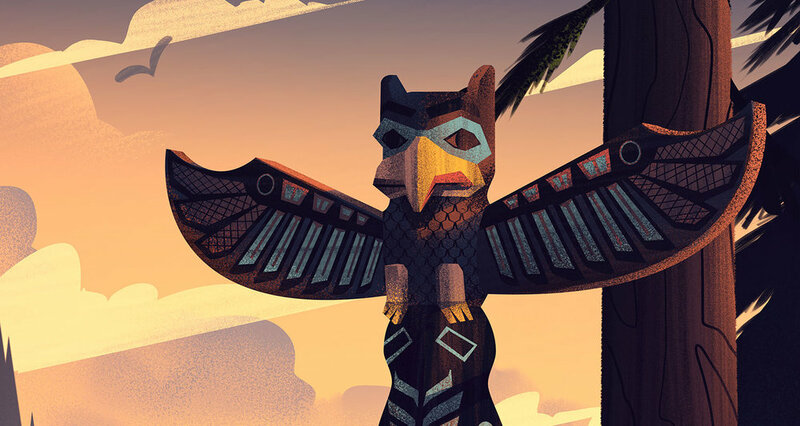 To create 3 unique posters for their new state of the art 'flying theater' arial adventure through the gorgeous state of Washington. The ride, similar to Disney's Soaring Over California ride, allows patrons to fly over stunning locations such as the Olympic National Forest, Mr. Rainier, San Juan Islands, and many more. The posters themselves would be nearly seven feet tall and would be displayed on the front of the Wings Over Washington structure as well as their gift shop. As a huge fan of these kinds of rides, especially the art which goes into them, you can see why I was so excited with this project. With that, let's dig into how these pieces were brought to life! Once the sketches were approved, I took a deep breath, and dove into the nitty gritty. With so many details to work into each piece and at such a large size, I was concerned the file size was going to be too much for my computer to handle. Thankfully, I found a piece of software from Alienskin called Blowup which allows you to work at a smaller size and then 'blow up' the final file to the right size. This meant I could work at a regular poster size and then, once all was complete, upscale the posters to window-display size. Still, my working files were close to 2gb (which is massive!). I decided to work sequentially with the Coastal scene first, followed by the scene through the forest, and finally ending with the Seattle skyline. When it was time for color, I decided on a rich color palette which would allow me to place areas of bright light in the distance to help pull viewers through the scene. This meant being able to add dynamic shadows which spilled across the landscapes to further reinforce the depth I wanted to achieve. It also allowed me to highlight areas I wanted to draw focus on. I am still and will forever be a student of lighting because there is so much an artist can accomplish with using it well. Some people are interested to know how long pieces like this take. The challenge with answering that question is its very difficult to measure simply because the work begins as soon as I accept the project and doesn't stop until I send off the final files. While it make take 90 hours of actual paint time, that doesn't take into consideration the time spent on visualizing the pieces or waking up in the middle of the night as a solution to a composition challenge suddenly hits you. The truth is, on these kinds of projects, I end up pouring everything I have into them and time serves only to remind me that at some point, I'll need to stop and turn them in. When I turned these pieces in, I was thrilled, exhausted, and satisfied (in as much as an artist can be) with the work, knowing that everything which went into my development as an artist served the needs of my clients well. That is my favorite part of doing what I do. Big thanks to Kyle Griffith and Brent Young for the incredible opportunity and collaboration on this project. If you are in the Seattle area, be sure to check out the ride because from what I hear, it is incredible! I also want to thank my agent, Deborah Wolfe, and her team for their tireless efforts. They manage so many aspects of this business which free me up to focus solely on the artwork. They're my advocates and cheer team and are as passionate about serving clients as I am - which makes for a fun team I am fortunate to be a part of!